Finding, getting and keeping a satisfying job that pays enough to support a family isn’t always easy. The Council for Economic Opportunities in Greater Cleveland can help. Our services are designed to serve and empower low-income and underemployed residents in Cuyahoga County by helping you attain the skills required to become self-sufficient. All services are free to eligible Cuyahoga County residents. There are many employment services and workshops available to you: Certified Customer Service Training, Microsoft Office, Job Readiness, Job Placement, Digital Connection and M.O.V.E.R.S Young Adults Program. We know employers are looking for people with basic technology skills, so we’ve created our workshops to help people learn them – including Microsoft Office, Word, Excel and e-mail. See below for details on the length of training and prerequisites for each workshop. Services are offered at either 1801 Superior Ave, Suite 400 in the Central Neighborhood Opportunity Center or 14209 Euclid Ave., inside the Forbes Early Learning Center. Hours of operation for both locations are Monday-Friday, 8:00 a.m. to 5:00 p.m., excluding holidays. Call the Central Neighborhood Opportunity Center at 216-651-5188 to get more information and/or schedule an appointment for intake. Prior to intake, you must complete the Request for Services Form, which identifies the service(s) offered by CEOGC Community Services Department. 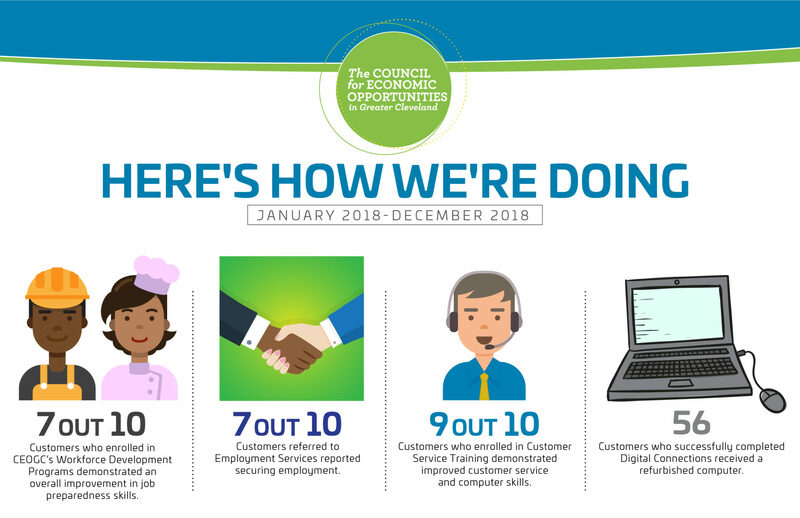 We’re proud to share how we’re doing! One-on-one interest and skills appraisals. Workshops demonstrate how to find open positions, fill out applications, write résumés and cover letters, make a good impression in an interview and know more about what your employer will expect of you. Referrals to one of our community partners for extra assistance such as computer classes. A customer service training program leading to certification. Job placement opportunities with employers in and around Cleveland. The Council provides these services and more at no charge to income-eligible residents of Cuyahoga County.